The market dove, and I made a nice profit. Let’s examine the chart. Notice the symbol in the upper left corner: ESZ09. “ES” is the symbol for the S&P 500 futures, just like “SPY” is the symbol for the S&P 500 ETF. But unlike an ETF, futures have a limited lifespan just like options. So the “Z09” part of the symbol tells you when the contract expires. “Z” signifies December, and the “09”, signifies 2009. Shorting in the futures is very easy; you don’t have to borrow stock, or satisfy any other requirements. All you have to do is click the “sell” button. So, in the example above, I sold one ES contract at 9:20am at a price of 1093 with a limit order. I let the trade ride until 11:40am where I bought 1 contract at 1078.50 with a market order to close out my position. So, I caught a 14.5 point move. How much money did I make? The ES pays $50 a point. So, on this trade I made $725, less TradeStation’s $4.70 per-contract commission. If I had traded 10 contracts instead of just one, my profit would have been $7,250. If the market had gone up by the same amount instead of down, $725 would have been deducted from my account. This was the morning of November 3, 2009. On this 1-minute chart, notice the symbol at the upper left. “NQ” is the symbol for the NASDAQ-100 futures. 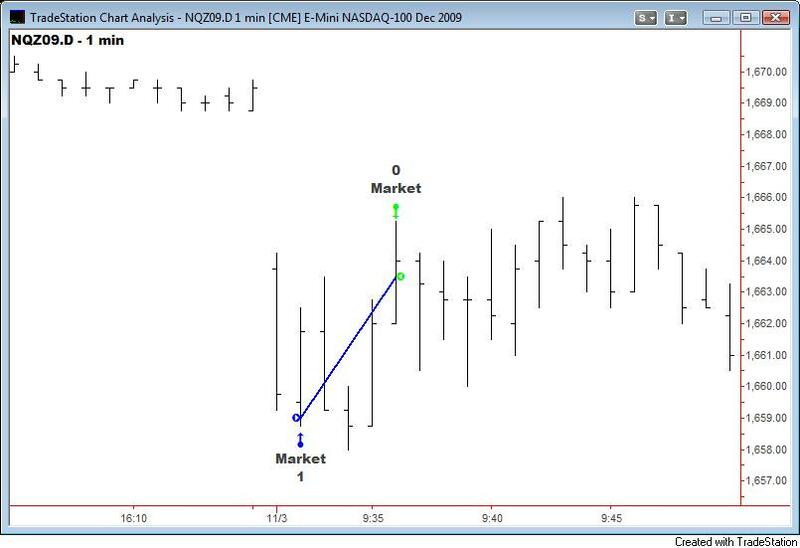 The “.D” is a special symbol provided by TradeStation which will give you a chart of only the daytime trading. 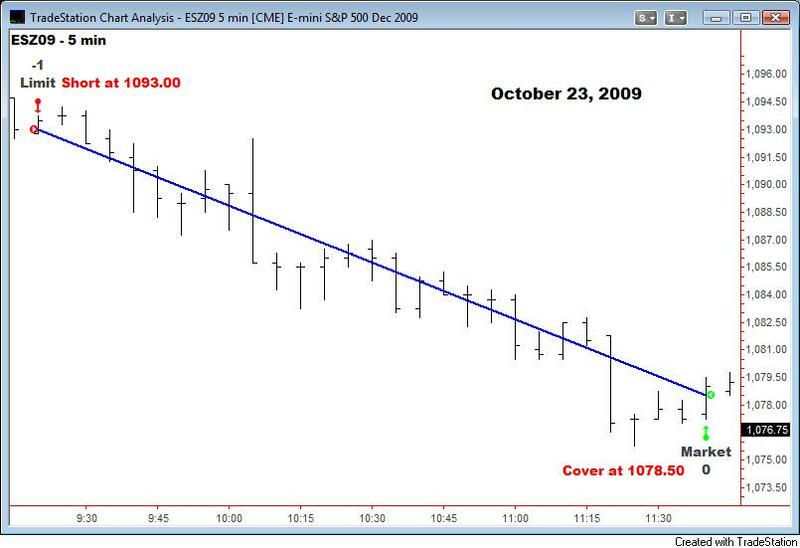 The futures trade around the clock, so using this type of chart allows us to see the gap-down that occurred at the open that day. I faded the gap and went long one NQ contract with a market order at 1659. Four minutes later, I sold it for 1663.50. So, I caught 4.5 points. What was my profit? The NQ pays $20 per point, so I made $90. Commodity futures work the same way, and you have all the same sort of things you do when trading stocks: stop-loss orders, trailing-stops, etc. The biggest difference between trading SPY and ES is that futures have leverage built-in, just like options or leveraged ETF’s, such as SSO or BGZ. So, there is quite a lot more pressure on you when the market goes against your position. 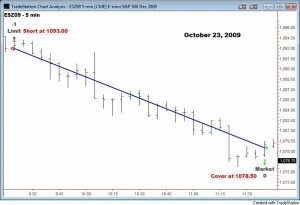 The futures track the S&P 500 very closely, though there is usually a couple of points difference the the price level. So, you think that you are ready for the big time? You think that you can trade futures? Is you crazy? Do you think that you can hit a major league fastball too? Bah! But somebody has to trade the futures, right? I guess it may as well be you. Your body is warm, I presume? Well then, step right up! That is going to happen. Mark my words. The reason why you think that you can make money trading futures is because your ego is so big that it has its own Congressman. You think that you have special abilities. Well, when the futures market is done with you, you will feel special all right – the “Special Olympics” kind of special. So, lesson number one is: adopt a humble mindset, because if you don’t, the market will beat one into you in a very unpleasant manner. When you take on the futures, you are taking on the beast itself: the beast of human nature. And it’s a rather nasty beast. Your mission is to make sense of psychosis as manifested in the market. I wish you luck. Just wait until you hit your first symmetrical-triangle pattern – you will be bankrupt in one day! 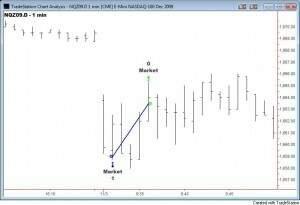 Step 3 – Why Trade Futures? For the same reason people play the lottery: you really can make absurd amounts of money every single day. There is a lot of leverage, so if you have skills, you will also have lots of money. Trading futures is actually very, very easy. If you think the market will go up, you bet on green. If you think it will go down, you bet on red. Easy as pie, right? Just like Las Vegas. In the futures market, you trade “contracts”, which we will discuss in detail further on. For now, you can think of a contract as a very, very volatile stock. You buy a contract just like you buy a stock: you pay a commission, hold it in your account, etc. For the S&P 500 futures, one “E-mini” contract adds or removes $50 per point to, or from, your account. So, if you buy one contract at the open, and the SPX rallies 20 points, $1000 is transferred out of the account of some hapless short trader, and into your account. Trade SPY and SH with real money first. Then trade SSO and SDS. Then trade futures on the simulator.